Until recently, System i high availability solutions were reserved mostly for large enterprises. Now that high availability is dramatically easier to use and less expensive to own and manage, the picture has changed. Thousands of small and mid-sized companies can now afford to cost-justify the "luxury" of rapid, complete data recovery. Interestingly (and fortunately), this shift is occurring when downtime is causing more of a disruption and expense to businesses than ever before. 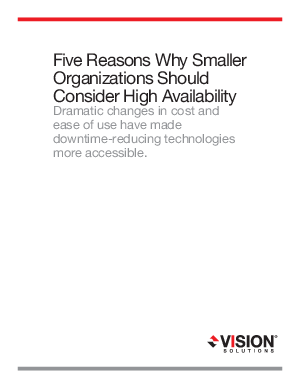 With technology costs dropping and downtime costs skyrocketing, companies have a huge incentive to evaluate System i high availability technology.